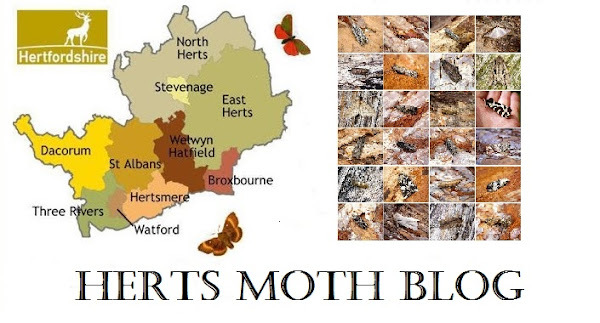 My Blog's aim is to promote and encourage others to participate in the wonderful hobby that is Moth-trapping. So why do we do it? well for some people it is to get an insight into the world of Moths, for others it is to build a list of species much like 'Twitching' in the Bird world. The reason I do it....you never know what you might find when you open up that trap! I hope to show what different species inhabit our Country by getting people aware of what is out there. On this Blog you will find up-to-date records and pictures. I run a trap regularly in my garden here in Hertfordshire and enjoy doing field trips to various localities within Hertfordshire and Bedfordshire. Please also check out the links in the sidebar to the right for other people's Blogs and informative Websites. Thanks for looking & happy Mothing! Any Species highlighted in RED signifies a totally new species for my records. Saturday night saw a reduced catch of moths but still two species were new for the year. The weatherhad been mild and breezy all of Saturday and with temperatures holding up into double figures again at night it was silly not to try and tempt some moths out. On Sunday there was a bit of Micro action in the garden with 1x Glyphipterix simpliciella, 15+ Cauchas rufimitrella, 1x Notocelia cynosbatella, 2x Epiphyas postvittana and 1x Esperia sulphurella in the space of 15 minutes whilst having a wander around the garden. Scilly 2018 Moths, dragonflies and birds! A view from the Attic.